Presidential hopeful Rudy Giuliani on Sunday continued calling on Sen. Hillary Rodham Clinton to denounce a liberal group's advertisement and apologize for what he calls her disrespectful treatment of a general. Giuliani, during a pre-race tour of the pits at New Hampshire International Speedway, told reporters that Clinton has shown weakness in not rebuking MoveOn's full-page newspaper ad last week, which criticized Gen. David Petraeus, the U.S. commander in Iraq. 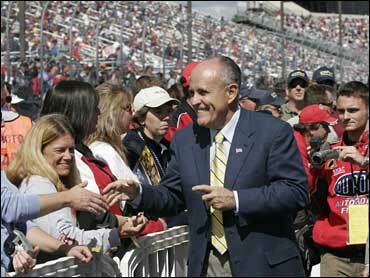 "What she did was just plain wrong," Giuliani told reporters before the NASCAR-Nextel Cup-Sylvania 300. "It was wrong for her to attack the integrity of a commanding general in a time of war." The MoveOn ad in The New York Times asked, "General Petraeus or General Betray Us?" Giuliani followed up on Friday with an ad in the Times that attempted to link Clinton to the attack on Petraeus. The Giuliani print ad accused Clinton of participating in a "character attack" against Petraeus, citing her comments during a congressional hearing that the general's progress report on Iraq required a "willing suspension of disbelief." Giuliani said Clinton should rebuke MoveOn and other groups like it. "I know that MoveOn.org contributes hundreds of millions of dollars to Democratic campaigns. But it's the way in which they contribute it, that's really the offensive part. They contribute it, by and large, doing character assassination on Republican politicians and they get away with it," Giuliani said. "But they should not be allowed to get away with it when they try to do character assassination on an American general who is putting his life at risk to protect America." Clinton's campaign said Giuliani has taken a few words from her remarks out of context for political purposes. Clinton praised Petraeus for "long and distinguished service to our nation" before asking what the campaign called "tough questions about the president's Iraq report." A Clinton spokeswoman said Giuliani has taken the campaign away from substance and toward mudslinging. "Instead of distorting Senator Clinton's record in the campaign's first attack ad, the mayor should tell voters why he thinks sticking with the Bush Iraq strategy makes sense," Kathleen Strand said. "The country wants change and while Hillary Clinton is focused on ending the war, Mayor Giuliani is playing politics." Giuliani said he's not dragging the campaign into the gutter, merely defending Petraeus' honor. "I didn't attack an American general. I am raising a point about an American politician, not about an American general," said Giuliani, who attended his second NASCAR event since joining the presidential race. On Saturday, during a conference call with reporters, Clinton sidestepped an opportunity to apologize for MoveOn's ad. "I have repeatedly not only expressed my strong admiration and support for our men and women in uniform but with respect to General Petraeus, I have also made my respect for him abundantly clear and I think that speaks for itself," she said in a call to announce the endorsement of retired Gen. Wesley Clark.